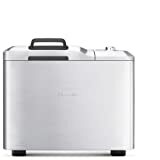 If there is one bread maker on the market that stands out from the rest, it is definitely the Breville BBM800XL. There’s no contest. It is absolutely the best bread machine in terms of customization, capacity, and technology. It’s as if the bread maker came out of the Iron Man movies. Although the machine is a bit large, the size is quite fitting to the amount of power it commands. How can we explain it. It’s as if the Breville BBM800XL walked into the party and everyone begins staring at it because of the aura it gives off. It’s a thing of beauty. The Breville BBM800XL has a beautiful, complete stainless steel design. It is rectangular and beside the lid there is a super large “smart” LCD display with neatly designed buttons around it. On the lid, there is a large viewing window where you can the bread. One cool feature of the Breville BBM800XL that none of the other machines have is the automatic fruit and nut dispenser. This is attached to the lid and at the right moment during the kneading phase, the dispenser incorporates fruit and nut into the dough. This is great for people who don’t want to go back to their bread machine and manually insert the ingredients. The Breville BBM800XL continues to wow. It comes with a “collapsible” kneading blade which means it won’t stick to your bread when it bakes like almost ALL of the other machines. For making jam, it also comes with a dedicated blade. So you get two types of blade with this machine. The machine, remarkably, also has 13 different settings including some unique ones like yeast-free, crusty loaf, and gluten-free. There is also a “custom” option for bread makers who want to set everything themselves. Breville calls the BBM800XL the “smartest bread maker. Ever.” We can see why. This machine is BEAUTIFUL. If you compare bread machines to cell phones, the Breville BBM800XL would be a smartphone and every other bread machine a regular phone. Immediately, we noticed that the LCD screen is large. On other bread machines, you would push buttons to select your cycles, but on this one you rotate the main knob and see your selection on the screen. Very cool! The LCD screen also has a beautiful blue background light that matches nicely with the stainless steel. The only thing we found awkward after unwrapping is realizing how much space it takes on the counter. So if you don’t have much counter space, it could be a problem for you or you’ll have to make some! Perhaps the coolest feature is the automatic fruit and nut dispenser. We’ve never seen anything like this on any of the machines we’ve reviewed. Breville calls it their “innovation”. What happens is at a certain moment during the kneading cycle, if you added any fruit or nut into the dispenser, it will automatically drop into the dough. This is useful for people who make a lot of bread with added ingredients. You don’t have to be around to add them. You know what that means? Say you use the 13-hour delay timer, and you set your bread machine to bake in the middle of the night. You won’t have to wake up to add any fruit or nuts with the automatic fruit and nut dispenser (which defeats the purpose of a delay timer!). For other timers you might only be able to make basic bread, but with the Breville BBM800XL imagine waking up to a fresh walnut and raisin bread! We applaud Breville for making this feature. For many years, Zojirushi has been on a level of its own when it comes to well-made bread machines. But after using the Breville BBM800XL we really believe this machine is on par with the Zojirushi machines. We’re really pleased to see a high-end competitor because that means more choices for us! Beautiful and smart, the Breville BBM800XL is a wonderful machine to own. It is jam packed with lots of cool features like an automatic fruit and nut dispenser. With the capability of baking delicious loaves of bread, the bread maker deserves its high rating. Can you tell how excited we are with this machine? We love it. It’s everything you want in a bread machine. It’s beeeeeautiful, it’s high-tech, it’s quiet, it’s sturdy, it’s so easy to use…we could go on and on about this machine. The only thing we don’t like is the price tag, which is about $250. But then again high-end bread machines like Zojirushi (which in our books makes the best tasting and looking breads) cost around the same. This is another alternative and we can justify it. And if you bake bread all the time we think you’re going to save money anyway so it’s worth it. I’ve been using the Breville for some time now and have always gotten great results with it. One really nice feature is the interior light to get a better view of the bread. Makes great bread and great jam to spread on it. Had Breville BBM800XL for about 3 years now.Use it probably once a week.Last year it started having problems.During the baking process the machine started blinking from inside and kneading function also started to ruin the bread. Tried a few times after that same problem every time.Only 1 year warranty.Very dissapointed.My previous bread machine was way cheaper and lasted more than 10 years without problems. Hi Gabriel, so sorry to hear about the troubles you’re having with the machine! Sounds like some sort of electrical problem? Try to contact Breville, maybe they can help!